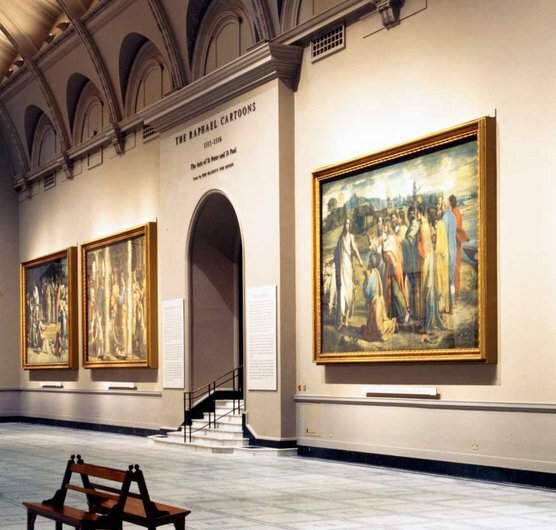 At the V&A there is great excitement in the Raphael Cartoon Gallery which was formerly restored by Hopkins Architects to house Raphael's designs for tapestries. These had originally been in the Royal Collection, and latterly on long-term loan to the V&A but to mark the Pope's visit, four majestic tapestries from the Sistine Chapel, woven according to his designs are now on view beside their templates. The effect is to make anyone who has ever wondered at the cartoons, marvel at what they were actually for and where they are from.